In an early blog post, I described how Stockholm’s Earliest Urban Plan called for a series of different street grids that radiated out from the Royal Palace. 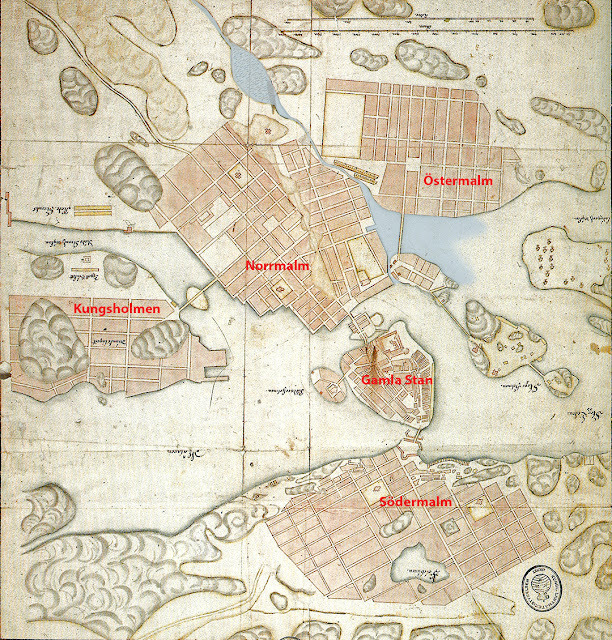 The shifting points between the rotated street grids were determined by geography—the street grids on Kungsholmen and Södermalm, both islands, were naturally different than the grids of the mainland. North of downtown, the plan called for three different grids which are slightly rotated from each other. The two grids of Norrmalm (orange and yellow) are separated by a high ridge which made a uniform, connected grid difficult. 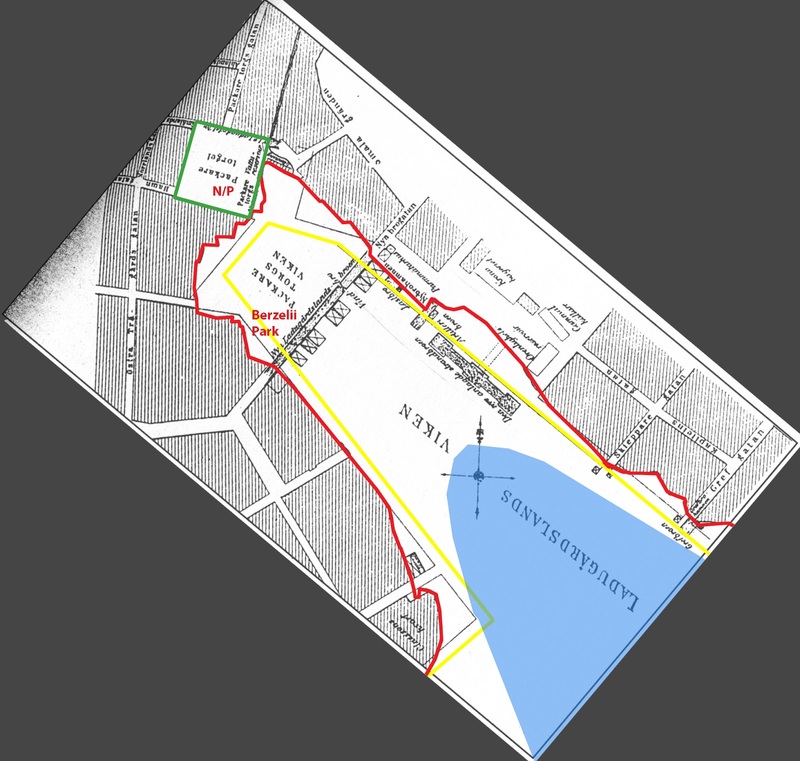 The shift in grids between Norrmalm and Östermalm (yellow and green) occurs at a low point in the land that was filled with water until the mid-1800’s. While there is now little trace of the creek, harbor, and swamp that separated Norrmalm and Östermalm, this low-lying area is still a noticeable boundary between two distinct areas in Stockholm. This blog post covers Nybroviken, Raoul Wallenbergs torg, Berzelli Park, Nybroplan, and Norrmalmstorg, a series of open spaces from the water’s edge into Stockholm’s fashion and business district. In this plan from 1663, a small lake drains both northward into Brunnsviken and southward into Nybroviken. The lake (called Träsket) and the creek (called Rännilen) running southward were the original boundary between Norrmalm and Östermalm (I have made the lake and creek blue for clarity). In 1642, the queen decreed that all fishing boats from out in the archipelago would use a harbor at Packartorget, or “Packing Square,” instead of one of Stockholm’s main harbors where large, international ships docked. The “packing” referred to barrels which were filled with salt and herring for export. In addition to fish, the square also became an important market for other local products that were sold to the city’s citizens to meet their daily needs: hay, firewood, and charcoal were especially important goods that came in from surrounding areas on small boats to Packartorget. Plans were drawn up to build a formal, rectangular harbor with quays at Packartorget’s edge. A long stretch of the water’s edge was thus to be regularized with a long, straight dock. When the plans were drawn up, the entire square was still under water, so the project involved filling in wet areas and creating large new areas of solid land. In addition to wooden docks and quays, archeological digs have found purposefully sunken boats filled with gravel as the first layer for filling in the land. In addition to being a harbor and a market, Packartorget also served as one of the city’s places for corporal punishment until 1810. 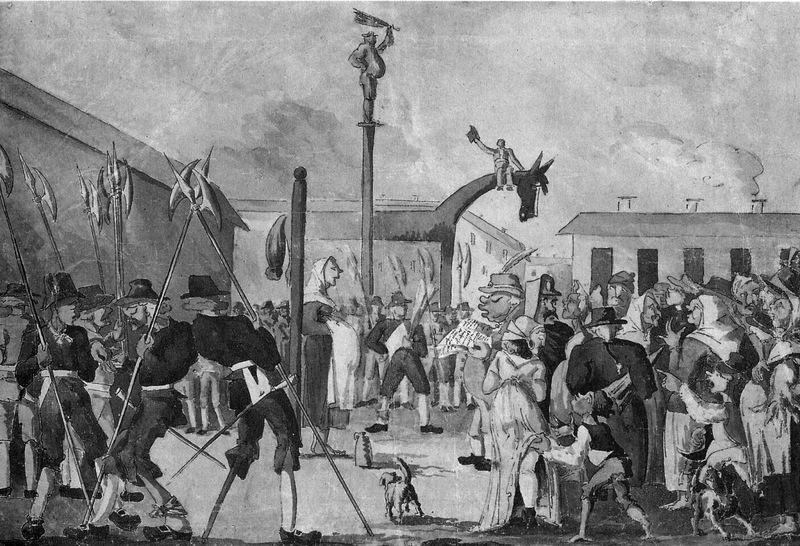 No executions were performed here, but the public was frequently entertained by other punishments when sinners were tied to the “Shame Pole,” petty criminals were given lashes at the “Punishment Pole,” and carriage taxi drivers who extorted illegally high fares were forced to sit upon the pointy back of the “Wooden Horse” with weights hanging from their feet. The latter punishment was given at Packartorget because many of the city’s taxi-stables lined the square. This harbor from the 1640’s and -50’s didn’t last long. Not only was the land rising and making the harbor shallower and shallower with every passing year, but the bay was also serving as an illegal trash dump. By 1675, the harbor had already been moved outward. During the 1700’s, the harbor was moved outward several more times. This map from 1749 shows that the water’s edge had moved outward and that the bay had shrunk considerably in just 100 years. 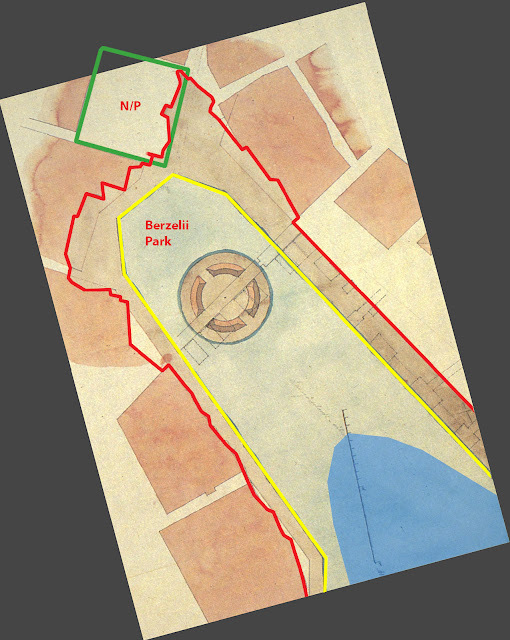 Plans for straight streets along the bay’s edge were overlaid onto the actual conditions which were far less organized. Proposal from 1749. Red = waterline in 1749. Blue = waterline today. Green N/P = Norrmalmstorg/Packartorget. Yellow= Proposed harbor and quayside. The above proposal also shows a new bridge which was built in 1742. The older bridge visible on the map from 1663 stretched from Blaiseholmen, at the time a small island separated from the mainland by a narrow channel, to Östermalm. On the map from 1749, Blaiseholmen is no longer an island but is attached to the mainland, and the bridge has moved farther in the bay from Blaiseholmen up to Norrmalm. Nybroviken, or “New Bridge Bay,” eventually became the commonly used name for the bay. There is a long, written record of complaints from the area’s citizens to the city and even to the king about the bay’s condition. Some complained about how hard the harbor was to use and about lost income. Others complained about the smell emanating from the bay’s still, swampy water and the piles of trash lining the bay. Still others complained about the unhealthy effects of the illegal but common practice of dumping out latrines into the bay under the cover of darkness. The city’s coffers were literally empty so nothing was done to remedy the situation other than one ineffective attempt to dredge the bay. By 1800, the inner area of the bay near Packartorget became completely unusable and boats began to tie up on the eastern shore instead. “Packing Square” was no longer used for its original purpose. A series of plans to regularize the shape of the bay were drawn up through the 1700’s and early 1800’s. All of these plans failed to address the inherent problem that the inner part of the bay was too shallow and that its water was stagnant. Instead, the plans focused on beautification of the city with stately quaysides and waterside avenues. I find it strange that the plans addressed beautification only in terms of looks—the fact that the shallow, inner part of the bay was stagnant and stinky didn’t seem to be on the beautification agenda. Even less attention was paid to the fact that the inner part of the bay was unusable for shipping. Proposal from 1787. Red = waterline in 1787. Blue = waterline today. Green N/P = Norrmalmstorg/Packartorget. Yellow= Proposed harbor and quayside. Despite all of these proposals over the course of a century, work on the project didn’t begin until 1816. The initial focus was the building of the waterside avenues. The project involved a number of land transactions because the lots historically extended all the way to the water’s edge—now they would be cut off from the water by the avenues. Progress was slow but steady. As I mentioned, the project to line the bay with stately avenues didn’t really address the problem that the innermost part of the bay still stank and was still filled with trash and sewage. In 1834, a cholera epidemic raged through Stockholm killing at least 4000 people. Even after the 18th century prophesies of deadly epidemics were fulfilled, the city still wasn’t prepared (in terms of both will and economics) to do something about the problem. The city didn’t act in order to make the bay healthier for its citizens after the cholera epidemic of 1834, but in 1837, the city decided to replace the worn wooden “New Bridge” with an iron bridge in celebration of the King’s 25th anniversary on the throne. The King at least had his priorities in order and insisted that instead of a new bridge, the swampy inner areas of the bay should be filled in and made into a park and that a stone quay should be built at the water’s new edge. 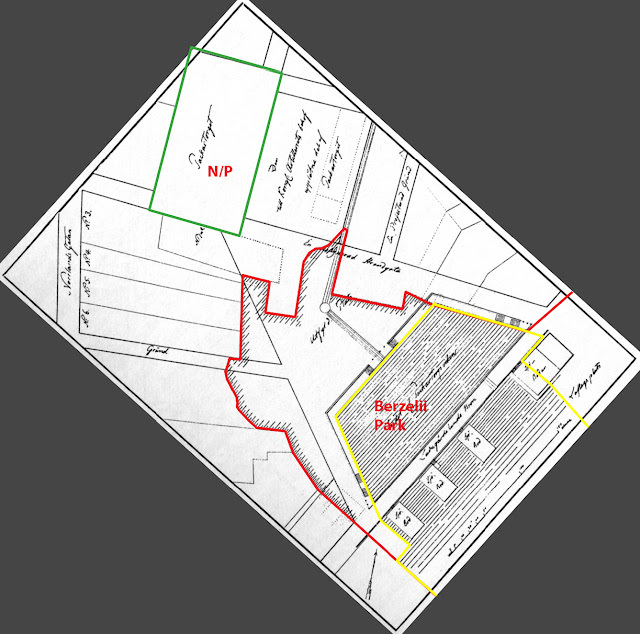 Work on this revised plan began in 1838 but proceeded slowly. The inner bay was filled in almost immediately but the new stone quay, which was lined by a cast-iron railing, wasn’t opened for traffic until 1848. The park’s design was drawn up in 1852 by Knut Forsberg and it was opened to the public in 1858, becoming Stockholm’s second public park after Strömparterren. 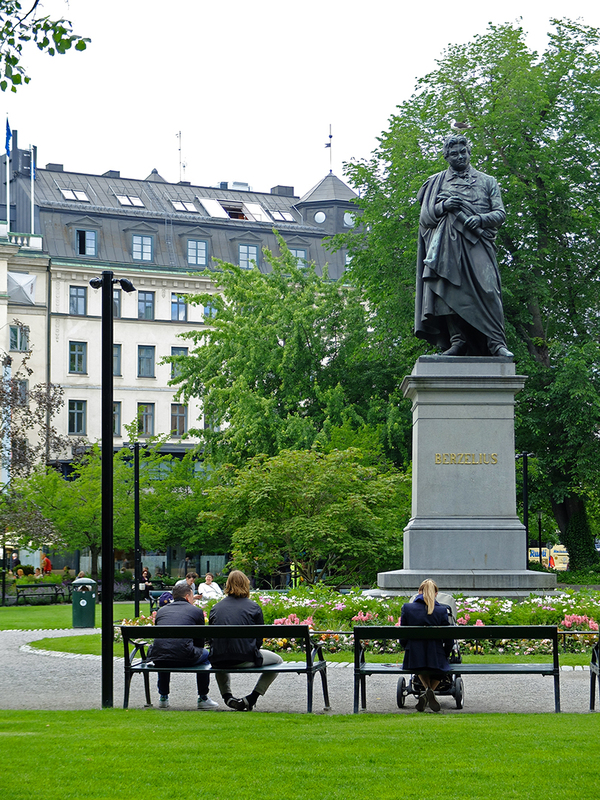 A statue of the prominent Swedish chemist Jöns Jacob Berzelius was erected in the center of the park, giving the gardens the name Berzelii Park. The statue of Berzelius was Sweden’s first public statue of a non-royal subject. Not only was the park meant to be enjoyed by commoners, but the park even honored the accomplishments of a commoner. Times were seriously changing. About every 50 years or so, new sculptures have been added to the park, but the park’s design, plantings, and layout have remained fairly constant. The park provides a small but important element of green in the city's landscape. 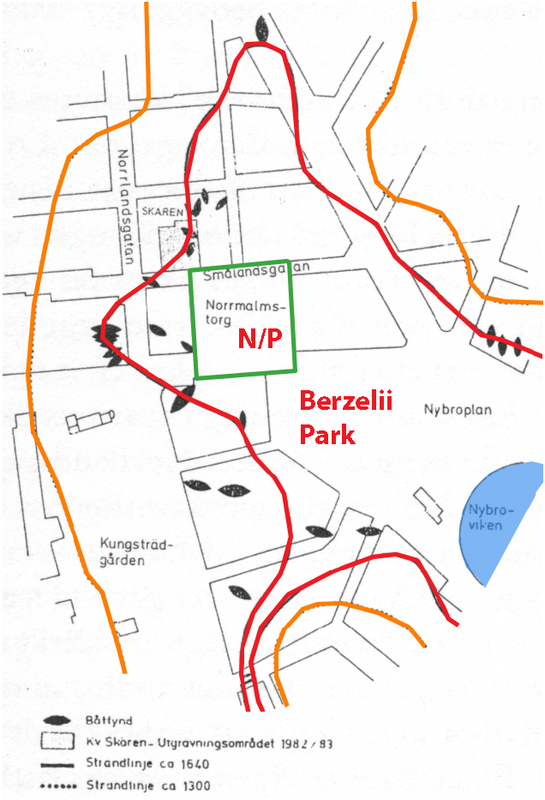 Like Strömparterren, Berzelli Park became a prominent part of Stockholm’s entertainment scene. Berns opened a cafe at the park’s edge which was enormously popular. In addition to refreshments, the cafe also provided live music. If one didn’t have money to sit inside, one could picnic on the park’s lawns and hear the concerts for free. Over the years, the cafe developed and expanded and Berns Salonger is still a popular upscale restaurant and night club. In the 1920’s, a China-themed movie theater was built next door to Berns. Berzelli Park’s reputation as Stockholm’s entertainment center became even more entrenched. Today, the theater holds large shows—often Swedish versions of Broadway hits. 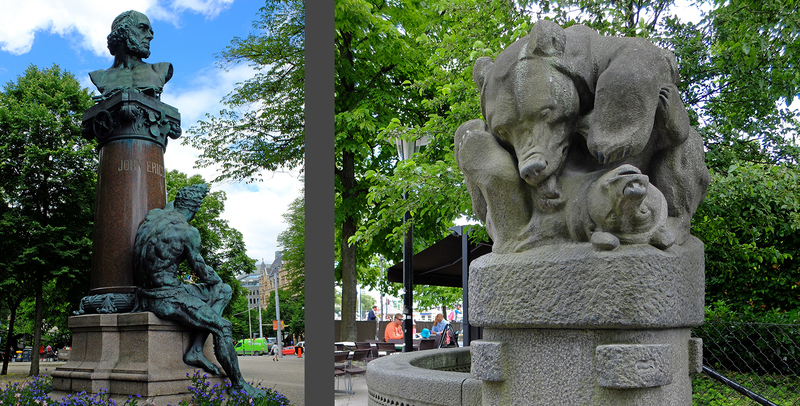 In 1853, a prominent citizen who had property lining Packartorget petitioned the city to change the square’s name. Not only did the name refer to a function that that the square hadn’t served for at least 50 years, but the name was also negatively associated with criminal activity and corporal punishment. 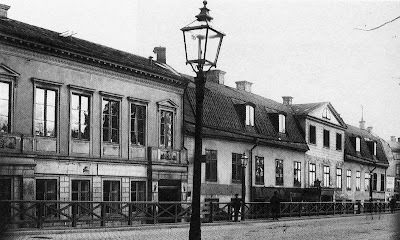 The city agreed and the name was changed to the current uninspired Norrmalmstorg, or “Norrmalm’s Square.” Even the street lining the square changed names from Packartorgsgatan to Norrmalmsgatan. 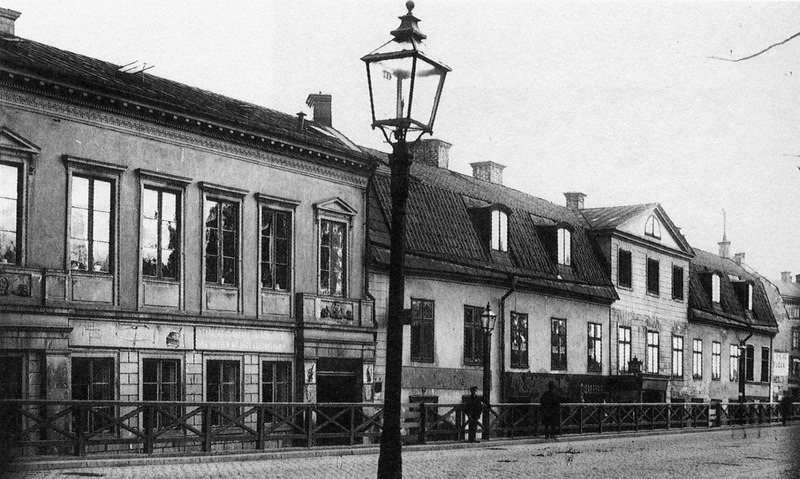 Photograph from 1891 showing the buildings lining Norrmalmstorg before the district became fancy. When the square was known as Packartorget, it was filled with the activity and stink of the working class—fish and sewage and corporal punishment didn’t exactly add up to a fancy address. But when the fish and sewage were cleared out, the bay was filled in, and the corporal punishment moved out, Norrmalmstorg was suddenly valuable real estate in the middle of the city. The low, almost countryside pattern of settlement was replaced by large, showy urban buildings housing banks, fine tailors and dressmakers, and upscale cafes. Along with the change in name, the new park, the new waterside avenues, and the new swanky quayside, the surrounding activities and buildings also changed. Historically, the water’s edge was used as an official city trash and sewage dump, but that was obviously now out of place. Instead, Nybroplan or “New Bridge Square” became the setting for the Royal Theater, the posh Berns Salonger, and stately edifices such as the Hallwylska House. On the eastern side of the bay, Strandvägen was developed into Stockholm’s Fifth Avenue. I’ll come back to Strandvägen in a later post. 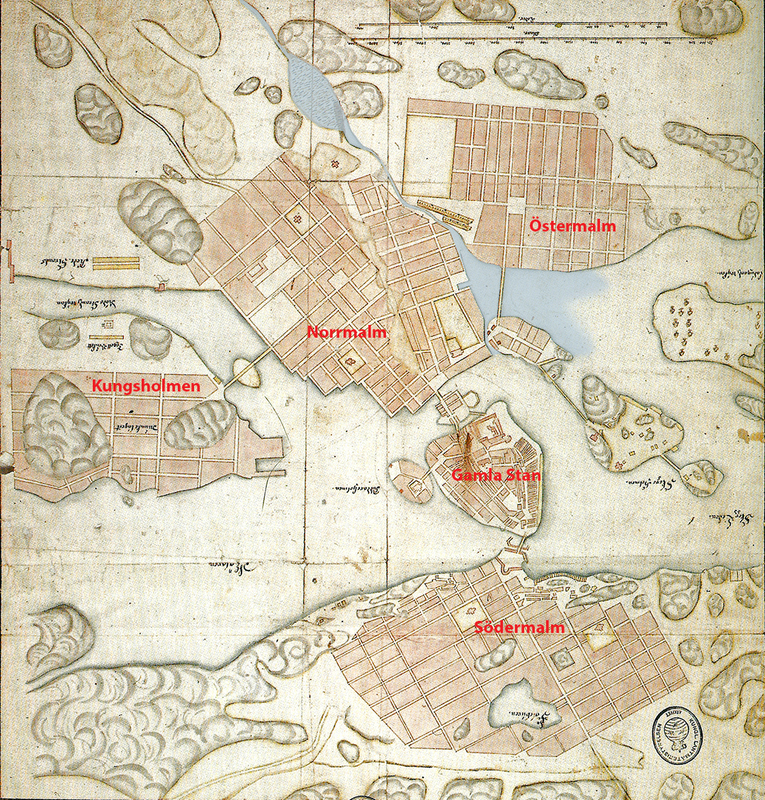 Not only was the inner part of the bay filled in, but the creek which served as the boundary between Norrmalm and Östermalm was also filled in. There were discussions of building a canal, but the canal idea was abandoned in favor of building a Paris-inspired boulevard. I’ll write more about this boulevard, Birger Jarlsgatan, in a later post, but this prominent street now serves as the boundary between Norrmalm and Östermalm instead of the old creek. Changing traffic patterns through the last 150 years have also brought physical changes to the area. Trams have come and gone and come back, cars and parking lots have taken over and then receded. Pedestrians have always been numerous. 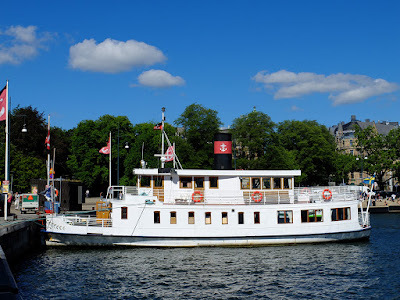 Once numerous steamboats have been replaced by numerous sightseeing boats for tourists, but the quay is also still used for a few of Stockholm’s public ferries (some of which are refurbished steamboats) and for one of the ferry companies serving the archipelago. 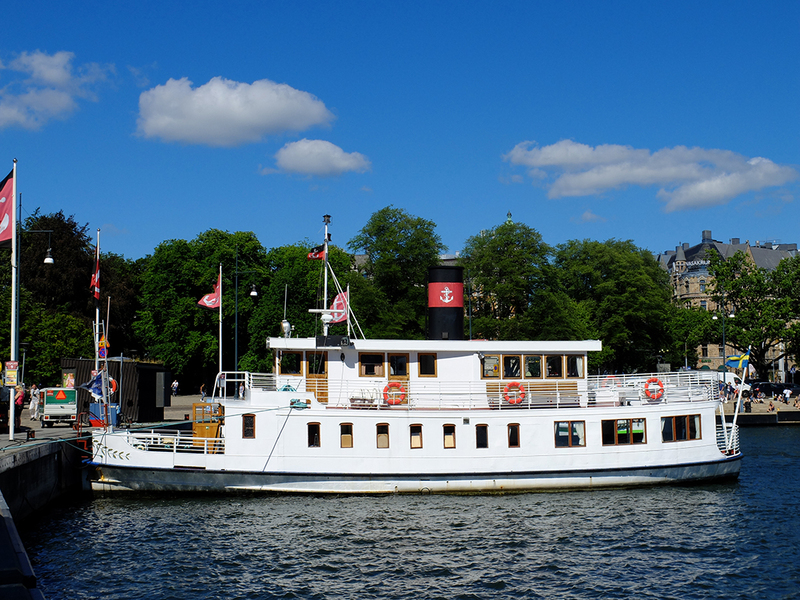 One of Stockholm's public transportation ferries is a refurbished steamboat, it stops at Nybroviken. The narrowing of the quayside roadbed in 2001 created a new public square between the water and Berzelii Park which was named for Raoul Wallenberg, a Swedish diplomat living in Budapest during World War II. He (obviously with the help of others) managed to save the lives of tens of thousands of Jews in Nazi-occupied Hungary by hiding them in buildings he rented, providing Swedish passports, and smuggling them out of Nazi territory. Reportedly he was also an intelligence agent working for the CIA. He disappeared in 1945 and was later reported to have died in 1947 in the hands of the KGB in a Moscow prison, but this has never been confirmed. Nybroviken, Raoul Wallenbergs torg, Berzelii Park, Nybroplan, and Norrmalmstorg are an example of how the interaction between geography, geology, and city planning can transform an area. 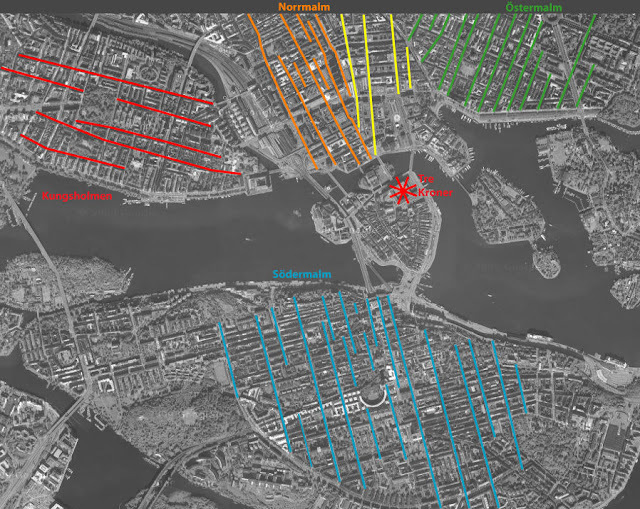 First, geography in the form of a sheltered bay provided city planners with a reason to create public spaces—the harbor and square at Packartorgsviken and Packartorget. The geology of rising land forced the planners to move the harbor again and again; eventually the city was forced to fill in the harbor completely. 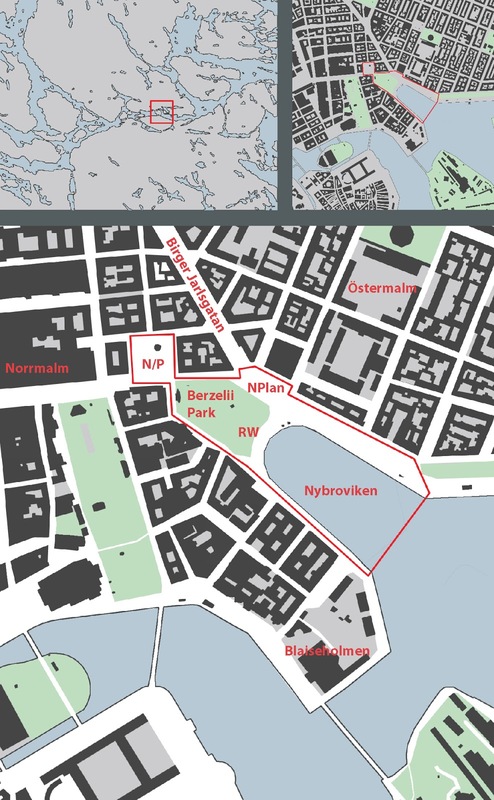 This geographical change created additional public spaces—the new quay at Nybroviken, the new squares Raoul Wallenbergstorg and Nybroplan, and the new greenspace Berzelii Park. Not only were new public spaces created, but the entire area was transformed from a stinking working-class milieu with very little infrastructure to a refined, exclusive environment of grand avenues, quays, and parks. Despite the transformation, this string of public spaces together with Birger Jarlsgatan still serve as a geographical boundary between two distinct areas of the city. The photographs are mine except for the interior of Berns which came from http://neumeister.se/work/berns/. 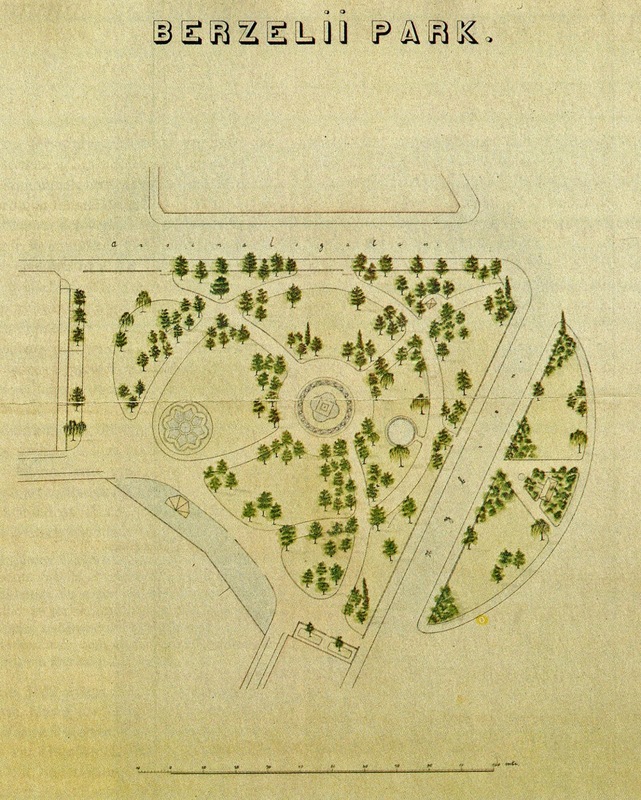 All of the historical drawings, maps, photographs, and artwork came from Bengt Järbe, Dofternas torg: Hur Packartorget blev Norrmalmstorg (1995). I have added the overlaid colors. 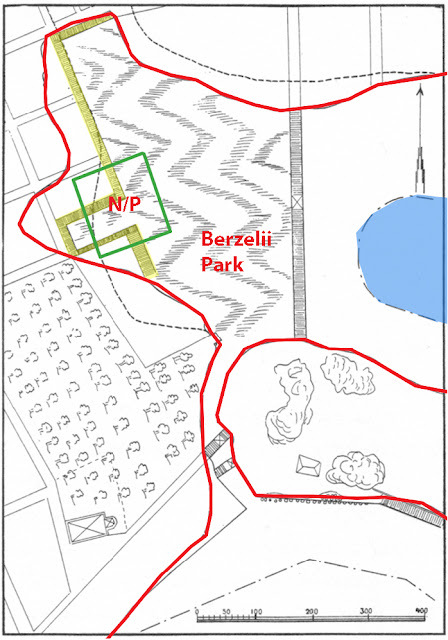 One exception is Berzelii Park’s original drawing which came from Wikipedia and the map from 1663 which came from Stockholmskartor by Nils-Erik Landell (2000).